At the urging of the PLV (Pretty Lady Veterinarian) and Happy Meal, Peas and Carrots was the first official burger destination for 2014. I managed to get myself done to a wispy 5% body fat as a gift to myself, and it was time to undue some of that good work. Note that the PLV is the woman from the bar scene at Father's Office several years ago...small world, right? Our first date.....a burger. Truth is stranger than fiction. We arrived during an evening when there was a fair amount of street construction, so we pretty much has the place and the proprietor to ourselves. Parking was easy to find in the neighborhood. The burger menu was extensive in terms of the creatures that were available to dine on. Kangaroo, Wild Boar, Red Deer, Angus Beef, Elk, Lamb, Camel, Buffalo, and Ostrich were all on the menu for burger and sliders. The sausage menu was equally interesting. We ordered a gang of burger and exotic sliders and settled in for a 10-minute wait. The Beef: The beef in the standard cheeseburger at Peas & Carrots was 80:20 Angus Chuck. The grind was medium. The medium-thick patty was juicy, tender, and quite beefy. By "tender," I meant "melt in your mouth" tender. The flavor was simple--beef and seasonings--there was no complexity from the simple Chuck, but the flavor and quality of the beef were well above average. The Camel was about what one would expect...it was mildly gamey and quite lean. The Kangaroo was really lean and tasted like a mixture of beef and shrimp. The Wild Boar was from a ranch in Texas. The piggies had consumed a wild diet of acorns and truffles, and the acorns were evident in the rich and complex flavors of the Wild Boar Slider. The Seasoning: The kitchen applied just enough salt and pepper to bring out the best from the humble Chuck. The Sear: Peas & Carrots applied a competent sear to my burger patty. The sear was by no means epic, but it did the job and provided a little crunch to the bite. The Preparation: The kitchen delivered a bunch of dishes all at once. Sliders, cheeseburgers, salads, fried zucchini, french fries, and a massive chicken sandwich. All of the the dishes were perfectly prepared to temperature and all were juicy, flavorful, and nicely presented. The burgers were all seared on a gas-fired, narrow-grated griddle. We ordered the standard burgers Med-Well, and the exotics Med-Rare, and the kitchen delivered accordingly. The Cheese: The cheese choices at Peas & Carrots were not quite as wide as the meat choices, but Mozzarella, Cheddar, Pepper Jack, and Bleu were available. We went with Cheddar on our burgers. The cheese was nicely melted and contributed to the juicy, tender, and creamy mouth feel of the bite. The Cheddar also added just a hint of acid and a bit of savoriness. 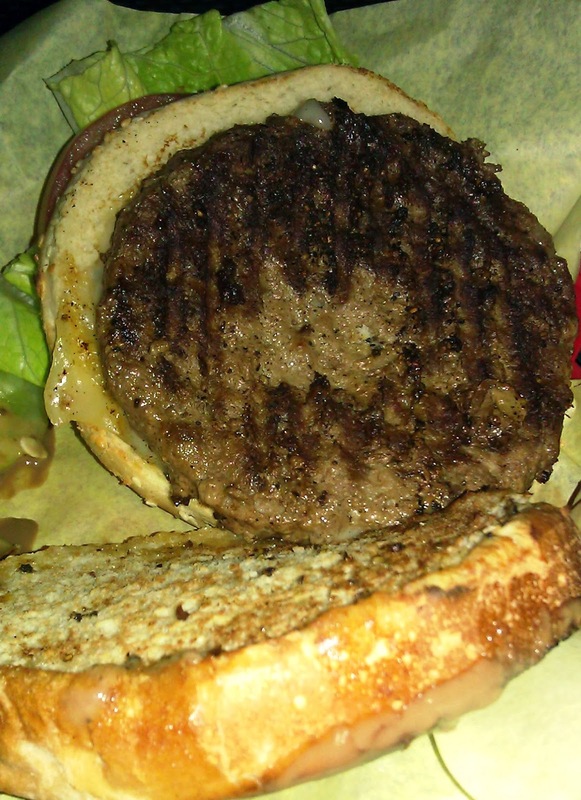 The Bun: The bun for the 1/2 pound burger was a seeded, well-toasted, moist, fresh, yeasty, and slightly sweet standard burger bun. The bun was toasted well enough that it lent crispness throughout the meal. 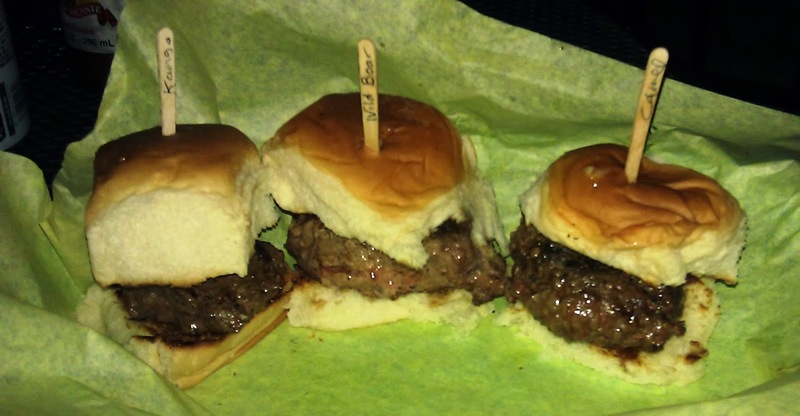 The buns for the 2-ounce sliders were sweeter, like Hawaiian rolls. These were also moist and fresh and perfectly toasted. The Meat To Bun Ratio: Peas & Carrots nailed this for both the standard burgers and the exotic sliders. The Fries: The fries were perfectly crisped and well-seasoned shoestring fries. I assumed that the fries arrived frozen and par-cooked, but they were just fine. The fried zucchini sticks were a challenge not to polish off. I failed that challenge--they were too delicious, and I was weak. The accompanying sauces of Ranch, Chipotle Mayo, Garlic Aoli, and Horseradish were all superb. The Toppings: The Romaine lettuce was fresh, crisp, and sweet. The tomato slices were thick, juicy, ripe, and hearty. The Value: The bang for the buck at Peas & Carrots was just right. Three of us left stuffed on enough food for 5 people for around 50 bucks. We ordered a lot of food. The exotic sliders were too enticing to pass up. Peas & Carrots boasted a menu that was quite broad in terms of choices of exotic proteins. The owner assured us that this was to expand further once the relatively new establishment built up more steam. The quality of the food and preparation were also solid, and the owner's extensive studio catering experience was evident. The burgers and sides were generous and flavorful. Other dishes that we observed leaving the kitchen were equally generous. 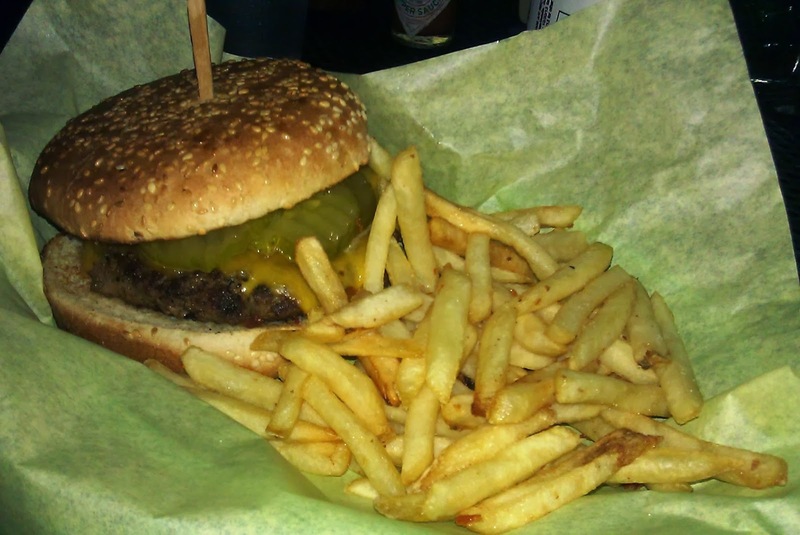 Burger Review : Peas & Carrots in Santa Monica delivered high-quality burgers for a fair price. Beyond that, they offered a wide variety of meats that we had not seen elsewhere. Go for the cheeseburger and stay for the exotic sliders. Those do not look like shoestring fries to me sir. Bah, I stand corrected. Thank you for your vigilance and attention to detail, my friend. Hey Pete, thanks for the wonderful and always engaging reviews. I would also love to get some health tips from you. For example, how can you eat so many burgers and not have a super high blood pressure or cholesterol? Aside from reviewing burgers, I also teach fitness and nutrition. Here's a link to my bootcamp....http://www.meetup.com/Tower-24-Fitness/ My diet is very clean outside of the odd burger. The diet can be found on the Pages link on the Meetup site. Feel free to hit me up at peteneumann@gmail.com for more. Thanks! I think I have seen your bootcamp several times while running on Ocean...is it the one right at the end of the California Street incline in Santa Monica? I may check it out one of these days. Thanks a lot! That's Bike Mike's Ultimate Beach Bootcamp. Mine is at 8:30 on Saturday AM....Tower 30 in Venice.